Organisations like the Pasdaran (Corps of the Guardians of the Islamic Revolution) are the visible part of an iceberg largely submerged in a distant past. They were not born with the Islamic Revolution of 1979, and don’t even hark back to the 1980s and the war with Iraq. There were already strong nationalist elements in the army of the old monarchy, in spite of its dependency on US imperialism for its equipment and 36,000 North American military advisors. Pilots of the Shah’s Air Force who had trained in US military schools fought in defence of Revolutionary Iran. Many died in the combats with abnegation and courage. The same goes for those in the Iranian Navy who fought the US warships and planes, to the finish, and with very few means. The army of the Shah took the side of the Ayatollah Khomeiny. The Shah did not use repression to the full and did not order to bombard Teheran. Not wishing to do that either, the North Americans (US) sought to find a replacement for the Shah. The latter, who had rather fallen out with the US, placed Bazargan at the head of a secular government and exiled Khomeiny to his ‘Vatican’ city of Qom. The behaviours adopted by the Shah and by Khomeiny had antecedents in the distant war of resistance against the Ottoman Empire (1743-46), and against British colonialism that had led to the separation of the province of Afghanistan (1857). The British had plundered the wheat supplies, causing penuries, famines, epidemics and the death of nearly one third of the Iranian population. In 1942, parts of the gendarmerie and of the army were rising to take power from British commanders. This 25 April 2018 commemorates the anniversary of the creation of the “Spahi Pasdaran”. The Spahi Pasdaran is the army of the Guardians of the Revolution. 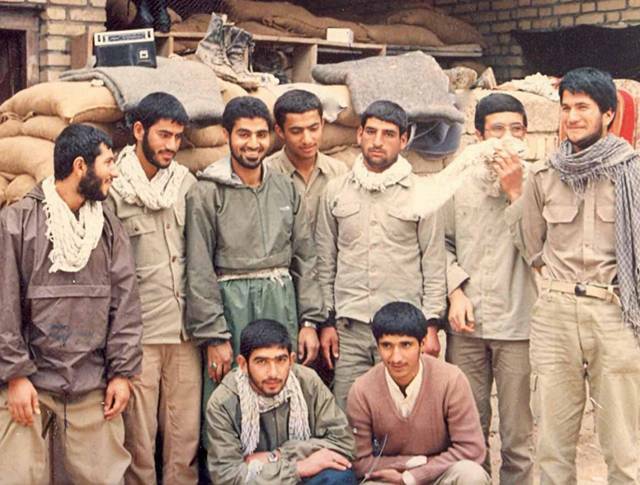 In 1979-80, Khomeiny ordered the setting up of a popular military body in parallel to the regular army. The idea was to be more effective against the onslaught of Iraq, the State coups from military chiefs (Aviation) and the US’ attempts at invasion from the Tabas desert. The aim was to improve the army’s performance by incorporating into it the spontaneous militias engaged in defending the revolution along with popular formations of Jihadists (for ‘holy war’) involved in developing infrastructures and agriculture. The Guardians of the Revolution came about in this way. 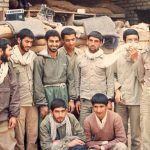 They set up popular and revolutionary dual-power forces to repel counter-revolution in the organs of power and in the apparatus of the Islamic Republic. The objectives of the Pasdaran were never purely national. Even Khomeiny, in his ideology, conceived the struggle as being between justice and injustice on the scale of the whole world, with proposals to export the revolution in all the Islamic world. Even before the Islamic Revolution (1979), Pasdaran commanders like commandant Chamran had shared this view; in Lebanon, they joined forces with Imam Moussa Sadr to set up Hezbollah, the aim being to oppose Israel’s occupation in parts of Lebanon. The Pasdaran also became linked with the Libyan revolution and Gaddafi. The Iranian and Arab fighters involved saw the Pasdaran as an international organisation for the liberation of the Islamic world. Although this idea was discarded by Khomeiny, it has a vibrancy in practice. The army of the Pasdaran developed the characteristics and practical skills of a national, regional and international revolution, popular and anti-imperialist. In it, a dynamic developed structures and functions through which it managed to resist all the intrigues, the assassinations of its commanders (individually or in groups), the international plots, certain elements of degeneracy and corruption even within itself – and the permanent meddling of Israel. During the 8 years of the war with Iraq , the Syrian Revolutionary State was the only Arab country to support Iran throughout. The Libyan Revolutionary State had supported Syria, but only in the beginning, by sending two ships full of munitions. The constant support of Syria prevented this [8-year] war from becoming ethnic – Arab world against Iranian world. The presence of the Pasdaran in Syria and their defence of Syria have been, even for them, an element of vital importance; it allowed them to maintain themselves as such, and even to reinforce their international, revolutionary and anti-imperialist character. Add to this the powerful and essential presence of the Russian army in Syria, over and above the political oscillations even in the Russian forces. Such are the two factors, national and international, that shaped and reinforced the army of the Guardians of the Islamic Revolution of Iran. Another element to explain the resilience and continuity of the Pasdaran lies in their dual-power struggle against the bourgeoisie. The latter is a privatising class incrusted in official apparatuses and parallel powers, but the Pasdaran have deep roots. They intervene intensely in the social, cultural and productive activities of the country, as ininfrastructures, agriculture, the civilian and military economy, the production of enriched uranium, of missiles. The Pasdaran intervene side by side with the army in the field of production. In production, the Pasdaran have created a de facto parastatal organisation working like an organisation of State. It regroups 350 private societies and employs one million persons. It is the greatest productive enterprise in the country. It intervenes in the construction of infrastructures, roads, motorways, pipelines, naval shipyards, oil tankers. That organisation has built the greatest oil refinery of the Middle East, the “Southern Star”; it is 90% finished, but it is stopped operating by government sabotage. Following the last Earthquake in Kermânchâh, the organisation of the Pasdaran intervened forcefully alongside the army to bring relief to each village, and build provisional homes in spite of governmental obstructions and injunctions. The Sepah and the Bassidj are popular militias. They too have a Pasdaran branch working with them in the field of agriculture, with the support of one bank. The two organisations are being confronted by the confiscation of the water supplies by the new latifundits . They (Sepah and Bassidj) oppose the government’s monopoly over the export of agricultural products when done at the expense of the internal market and whilst products are imported on pretext of drought. They refuse to obey this government  that combines with the WTO  to impose transgenic products on the country. The Pasdaran have built new nuclear power stations with Russian aid. They condemn the government’s refusal to set-up desalination plants. In several regions of Iran, the Pasdaran and local populations are transforming abandoned and parched areas into cutting-edge centres for agricultural production. They have revitalised ancient irrigation systems (the Ganat and Kaaritz)  in the semi-arid lands of the Iranian high plateau. They are involved also in educational and cultural activities, in literacy campaigns and in the construction of village schools. This struggle rages at all levels and in all fields. Remains to be seen how the Pasdaran are going to cope with the serious conciliation and growing submission of the apparatus of government towards the imperialist camp. The feature image shows a demonstration of Revolutionary Guards. Look in the right-hand column for J. Posadas’ book: “Permanent Revolution in Iran”. Latifundia: a very large private landed estate. The government of Hassan Rouhani. Ganat and Kaaritz: Types of underground irrigation canals.